Former US president George H.W. 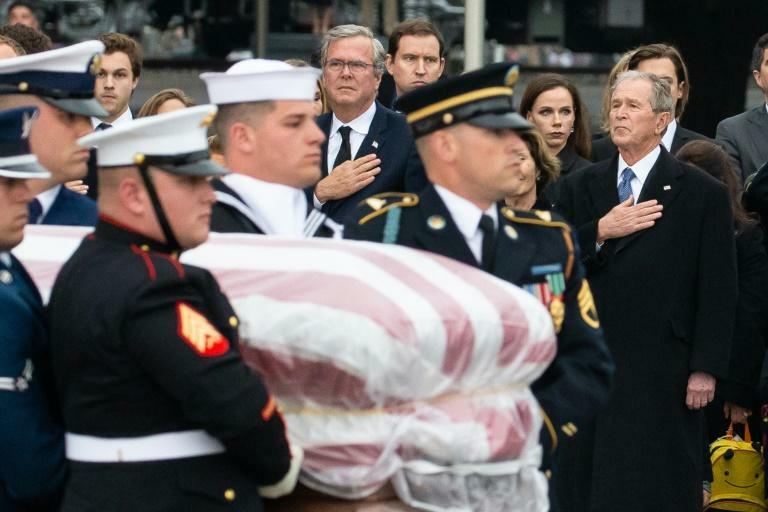 Bush, remembered as much for his legacy of service as his impact on history, was buried Thursday, capping days of tribute from a nation that briefly set aside political divisions to honor him. 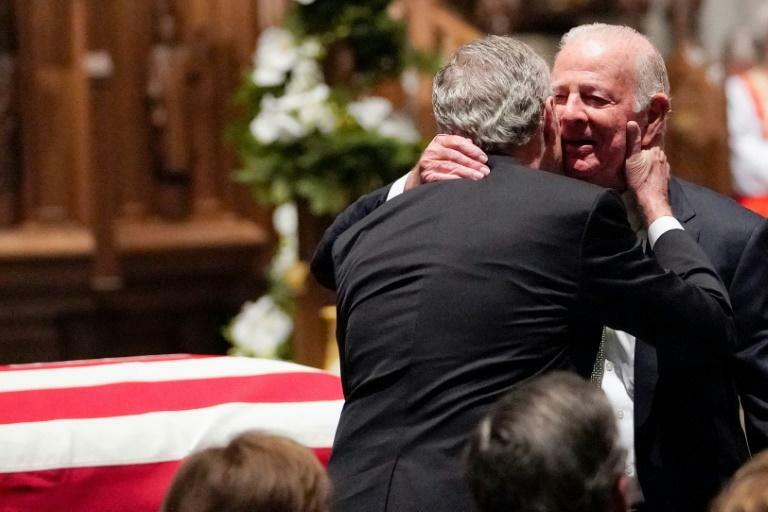 After a state funeral Wednesday in Washington that was attended by the country's five living presidents and foreign dignitaries, Bush's flag-draped casket was flown to Texas for a final farewell. A compassionate national spotlight had shone on Bush's passing and the memorial proceedings throughout this week. But his burial at Bush's presidential library center in College Station, Texas -- alongside Barbara, his wife of 73 years, and their daughter Robin who died of leukemia at age 3 -- was a private family service. "The 41st President of the United States of America, George Herbert Walker Bush, has reached his final resting place," family spokesman Jim McGrath posted on Twitter. Bush, who died Friday at age 94, lay in repose at St Martin's Episcopal Church in Houston, where he was eulogized at a final memorial service by close friend James Baker, who served as his secretary of state. "His incredible service to our nation and the world are already etched in the marble of time," Baker said, highlighting the sense of duty, service, and personal grace that drove Bush. Fighting through tears, the 88-year-old Baker recalled how Bush's deeds "expressed his moral character, and they reflected his decency, his boundless kindness and consideration of others, his determination always to do the right thing." 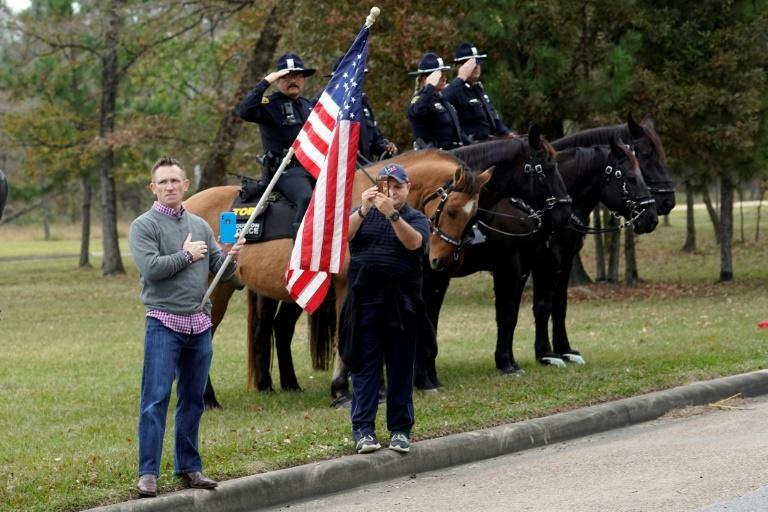 Son George W. Bush, the nation's 43rd president, appeared somber at his wife Laura's side, and stood ramrod straight as military pallbearers carried the casket from the Houston church to a waiting hearse. It was then placed on a train -- with a locomotive painted in the colors and pattern of Air Force One, the presidential jet -- for the final journey to the presidential library, part of a precise series of ritualized events. There were emotional displays along the route in towns like Spring, Magnolia, Navasota and College Station. Crowds of people braved rainy weather to mass beside the tracks, where they held American flags, saluted, cheered and waved goodbye as the train rolled slowly past. Bush was the 12th president to lie in state in the US Capitol rotunda. Thousands paid respects there to a statesman who steered the nation through turbulent times including the end of the Cold War and the marshalling of an international coalition to oust invading Iraqi forces from Kuwait. On Thursday, Baker pointed to Bush's eagerness to forge compromise and peace rather than rattle sabers. "He had the courage of a warrior," Baker said. "But when the time came for prudence, he always maintained the greater courage of a peacemaker." He served as a congressman, envoy to China and to the United Nations, director of the Central Intelligence Agency, and vice president to Ronald Reagan before winning the White House. At Wednesday's service in Washington, President Donald Trump and First Lady Melania shared a front row pew in the National Cathedral with past presidents Barack Obama, Bill Clinton, Jimmy Carter and their wives, to honor Bush. Son George delivered an emotional eulogy in tribute to his father. The pair are only the second father-son presidential duo in American history, after John Adams and John Quincy Adams. Since Bush's death, Trump has traded his usual provocative posture for one of solemnity and respect for the Bushes, with whom he has often clashed since his meteoric rise in the world of politics. As Trump toned down the rhetoric this week, Washington's political heat was reduced from a normal boil to a simmer. But at Wednesday's service, tensions were obvious. Trump arrived and shook hands with the Obamas, but his body language turned cold as he failed to acknowledge Hillary Clinton, his defeated Democratic rival in 2016, or her president husband Bill.